Wasps are a common spring and summertime problem for homeowners throughout Minnesota, whether you live in the Twin Cities, or a small town. Finding and handling their nests is typically best left to a professional pest control contractor for numerous reasons. Families who have small children, or those who are susceptible to allergic reactions, must be extremely careful, as a wasp’s venom can cause severe, sometimes fatal, reactions. Wasp nests can be high up in a tree or on the tip of your roof, where homeowners might have difficulties reaching it. The first step when dealing with wasps is to determine what type of wasp is calling your backyard home. Wasps are grouped into two categories: solitary or social. Social wasps (yellow jackets, bald-faced hornets and paper wasps) colonize in groups, guard their nests and care for their young together. Solitary wasps (mud-daubers, cicada-killers, spider wasps, and potter wasps) live on their own, make their own nest and are only aggressive if they are provoked or trying to protect their nest. Different from solitary wasps, social wasps create nests and gather in swarms. Once they make their nest, these fiery pests will continue to return to that location and become territorial–which is where the situation starts to get complicated for homeowners. 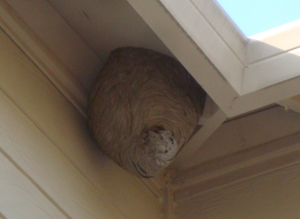 Most wasps like to create their oval-shaped nests in shielded, shaded areas such as under eaves, porch roofs, decking, sheds and steps. Wasp nests can be difficult to find because wasps can easily get into small areas, burrow into the ground or construct their nests high into the canopy of trees. One of the easiest ways to find a nest is to wait until dusk and watch the wasps’ flight path. Most of the time, it will lead you to the area of their specific dwelling. If you find a wasp nest somewhere within your home, make sure to contact a professional pest control company. Professionals have the specific tools and knowledge to quickly and efficiently identify and deal with any wasp nests they’ve located on your property. If you have a wasp nest that you need removed, call Ecotech today at 763-785-1414!